Is Your Office Space to Dark? If your office space is currently dark, gloomy, cold and cramped, it really could be unfit for business in every sense of the word. After all, offices normally serve two different purposes. They’re where you and your workers carry out your daily business, calling clients, completing paperwork, holding meetings and making important decisions, among other vital everyday activities. They are also often the place where you meet new and existing clients, discuss potential business deals and renew old ones, interview new members of staff and speak to business partners. So your office is much more than just a building in which you happen to do your work. You and your workers spend the majority of the working day there, several days a week. It’s important, therefore, that it is truly fit for purpose. Numerous studies over the years have shown that employees are much more productive when their working space is bright, clean and comfortable. Working in buildings where the lighting is inadequate or where the temperature is too hot or too cold and the furniture is old and uncomfortable can have a detrimental effect on their health. Your employees are far more likely to take time off sick if their working conditions are not ideal. Unhealthy working conditions lead to unhealthy workers, and even if your office is not unhealthy but just undesirable to work in, you may find you have a higher turnover of staff than should normally be expected. Whatever your mode of business, all of your staff should be able to communicate effectively without having to overcome obstacles, move around their office with ease, sit comfortably at their desks and work in a light, bright and pleasing environment at all times. No one wants to work in an office they feel uncomfortable in, even if they enjoy the work itself. If your chair keeps tilting backwards, your desk is not big enough to contain all your work, you have to keep your scarf on in the winter months because it’s so cold or you can’t see properly because the lighting is inadequate, you’ll soon be looking for another job. Bringing potential business clients into a dirty, overcrowded and gloomy office could be more than just embarrassing. Your office really is the first impression a client will get of your firm – and we all know that first impressions count. Clients who see your office as something to avoid may well not want to come back again. And it’s no exaggeration to say it could put clients off doing business with you – if your office doesn’t look professional, clients may think you’re not either. If you find yourself arranging business meetings in the local restaurant or bar instead of your own office space, it could be time to get something done before it leads to loss of business and, ultimately, profit. An office refurbishment will do nothing but good for both your workers and clients and, consequently, your business. Office refurbishment can encompass a whole host of changes, from modernising your existing office space with new fixtures and fittings to creating purpose-built offices or break-out spaces or simply refreshing the décor to installing complete heating and ventilation systems. And if you can’t afford a complete refurbishment, even small changes such as decorating, getting new furniture and fitting new flooring could make a big difference. Making even minor changes will show your workers that you care about the environment they work in and could lead to greater productivity. And there’s no need to go it alone. Experts in office refurbishment – such as those at https://www.ozoneinteriors.com/ – will be able to help you every step of the way. Get the professionals in and they will help you come up with the perfect design to fit your needs and your budget. They will work with you and the space you already have to determine the best way to modernise your office without breaking the bank. 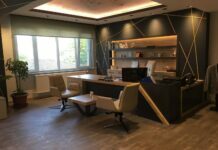 Using the latest computer technology, they will help you design a brand new office which will be the envy of all your competitors. Whether you just want new furniture, feel the need to create bigger meeting rooms or have an innovative idea to incorporate the latest technology into your office space, the refurbishment experts will be able to offer sensible advice and pass on the wealth of their experience. And even if you’re planning a major fit-out, the refurbishment can usually be carried out while you remain in the office – a good refurbishment firm should be able to work around you and your workers so you don’t have to move out. Next articleHow can a Virtual Mailbox make your life easier?